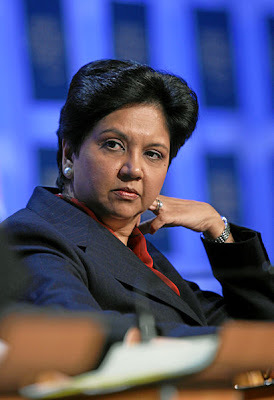 Weighty Matters: Is Pepsi CEO Indra Nooyi stupid, misinformed, deluded, ignorant or evil? Is Pepsi CEO Indra Nooyi stupid, misinformed, deluded, ignorant or evil? You pick, but it seems to me it's got to be one of those five choices. Forget about the fact that doubly-labeled water experiments suggests activity levels haven't actually changed much over the course of the past 3 decades. Forget about all those studies that state we're eating on average an extra meal worth of calories a day since the 70s. Forget about the fact that portion sizes have grown astronomically and that you can't pump gas, go to the gym, visit a hospital or walk down the street without an unending, easily accessibly supply of calories and junk food. It's exercise stupid. Why can't we just exercise. I bet that the hundreds of millions of overweight folks out there haven't ever tried to exercise to lose weight - because clearly if they did, they'd be skinny by now and drinking all the Pepsi they want, right Indra? Never mind the studies that report that regardless of the amount of exercise overweight women do, in the absence of dietary change they just keep gaining weight. Never mind the fact that obesity rates in toddlers have risen dramatically - clearly they're just not hitting the gym hard enough, lord knows I have a tough time getting my 3 year old to do her squats and bench presses. The thing is, someone like Pepsi CEO Indra Nooyi isn't likely to be stupid or ignorant - you don't get to be the CEO of a massive corporation by being stupid or ignorant. She's also unlikely to be delusional and given her stature, it'd be someone's head if she were misinformed. So she's likely not stupid, misinformed, deluded or ignorant (though I suppose anything's possible). And while I can't state for certain she's evil, as far as I'm concerned willfully, knowingly, and deliberately trying to deflect any modicum of Big Food corporate blame for obesity by shifting the entirety of the blame to individuals, is.